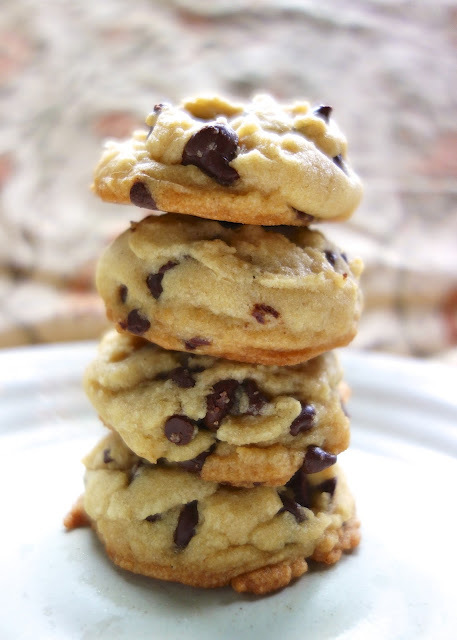 Coconut Oil Chocolate Chip Cookies - swap coconut oil for the butter! SO good! Just a hint of coconut flavor. Crispy on the outside and soft on the inside - perfect! I bought a jar of coconut oil at Trader Joe's and I wasn't sure what to do with it. I had a real craving for a chocolte chip cookie, so I decided to substitute coconut oil for the butter in one of my recipes. Oh my! The cookies were SO delicious! They turned out crispy on the outside and soft on the inside. Just the way I like them! I especially liked the slight hint of coconut flavor in the cookies. My favorite part about making these cookies was that I didn't have to wait around for the butter to soften. I just opened the jar of coconut oil and started baking. It was great for spur of the moment cookie cravings! Have you experimented with coconut oil? What is your favorite way to use it? Beat together coconut oil and sugars until light and fluffy. Add eggs one at a time, beating well after each addition. Mix in vanilla. Combine flour, baking powder and salt in a small bowl. Slowly add flour mixture to mixer. Stir in chocolate chips. Scoop dough into 2 Tbsp rounds. Place on prepared baking sheet. Bake for 10-12 minutes, until bottoms are golden brown. I've used coconut oil in banana bread before. Slight coconut flavor, but the kids still ate it up! I've been using coconut oil instead of vegetable, canola, etc. oil for some time now. All the vegetable oils you get in the US now are all gmo. So is any margarine made with corn or soy. I refuse to damage my body in that way, gmo's should be illegal. Coconut oil has worked just fine with everything. It's even cheaper to buy where I live. I use coconut oil or real organic butter. I use coconut oil in my cooking just like I would vegetable oil. I do use the one that doesn't have the flavor of coconut though. I think it is called Expeller Pressed. I also use the coconut oil that does have the slight taste for muffins or breads that sweet. I buy mine from Tropical Traditions. Great company!!! I love the flavor coconut oil leaves in my stir frys. Definitely going to try cookies now. I also use coconut oil to remove my makeup before washing my face, for hand and foot lotion and for hair conditioning before washing. Wonderful for my scalp! Tfs! Blessings. I use it for everything! Cooking, baking, smoothies and as a moisturizer! If using for health purposes it's important to use "Virgin Coconut Oil". I get mine from Tropical Traditions, they explain the difference in oils and why it's so important to use the virgin version. Great recipes Steph! My favorite use for Virgin Coconut oil is to add 1/2 cup to a sweet cream ice cream base (I use Ben & Jerry's recipe)along with 1/4 cup shredded coconut. Then during the last 2 minutes of freezing, I toss in 1/2 cup toasted almonds. OMG, coconut almond ice cream is my family's new favorite. I too use coconut oil instead of any other oil, except cold-pressed olive oil. But coconut oil is great in everything I make. And it does make a great moisturizer as well, I have some specifically for my face that I bought from a health food store. Think its called Pure....can't wait to try these yummy cookies. Coconut oil is a great dough enhancer in yeast breads and quick breads. I add 2 tablespoons coconut oil to a 4-loaf batch of bread. I also substitute coconut oil for all my cake and cookie recipes. One tablespoon of coconut oil in your rice krispy treats adds such richness. I use it in stir-frys, too. It adds a nice tropical flavor to rice, too. I use most of my coconut oil by making skin-care and medicinal lotions, balms and salves. The healing properties of virgin coconut oil are incredible and when I add pure essential oils the results are far beyond anything commercially available. Quality makes a difference. Over the last several years I have tried more than a dozen different kinds of coconut oil and I have had the best results with Tropical Traditions Gold Label coconut oil. They are running a special right now for buy one 16oz. jar get one free which is a great deal. I usually buy it when they run specials on the gallon buckets 2 for $99. Hi Stephanie! Is the substitution 1:1? Thanks! I also bought some coconut oil recently and haven't really known what to do with it yet. I'll have to try these out! I have been using coconut oil for a while. So far I have only bought the cheaper brand, Louana. It does not have a coconut smell or taste. I have been using it to bake with. I also use it to "cut" into flour for biscuits or something, comes out yummy! I did let it chill for a few minutes to let it get a little firmer before cutting into the flour. I am addicted to your mint chocolate cookies but these are pure heaven. My house smells absolutely amazing right now. Thanks for a great recipe. Jeff and Lindsay - You are welcome! Hope you enjoy the cookies! Steph, I made these and they are perfection! First time I have cooked with coconut oil. Thanks for the recipe - these are really good. So glad you liked the cookies! This was the first time I baked with coconut oil too. I love it! These look great! Do you measure the coconut oil in solid form or melt it first? Solid. I didn't melt it at all. Do you know what the calorie count is ? I just made this and they are so good! We had run out of butter in the house, and so I searched and found your recipe, definitely saving it! 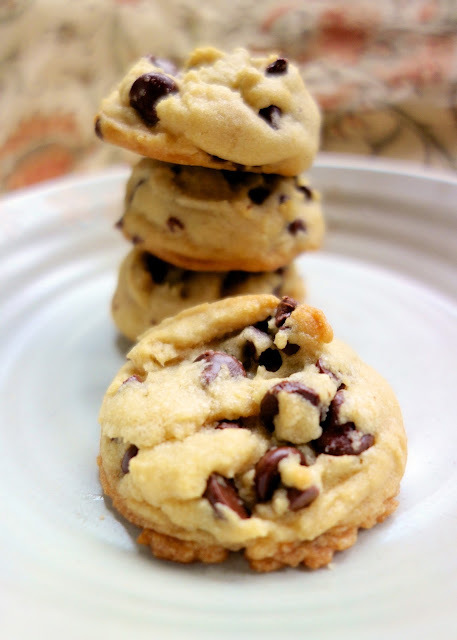 My only suggestion for others is that with the coconut oil, the cookies are very sweet, so using less sugar, or dark chocolate chips might work better to give some depth. All I can say is OMG!!! Loved these cookies! Could not believe how wonderful these were. I used bourbon/vanilla that I got at Trader Joes , when I picked up the coconut oil. These are now my go to cookie! just made these and they are delicious!!! Perfect recipe. Thank you! have you tried using a gluten free flour or almond meal instead of the flour? I'm Gluten-free, but these look SO good! I am making these now and was kinda iffy about coconut oil..But these are really good...I popped in some dark chocolate morals in with the semi-sweet. Can't wait till the family tries them.. I made these and the dough was too thick and didn't seem right so I added a small container of applesauce. (I think those are 4 oz). The cookies were a little cake-like than original toll house, but tasty. I don't understand why others did not have the thick, dry dough I had before adding the unsweetened applesauce. These look great! Coconut oil real is a wonderful replacement for butter!